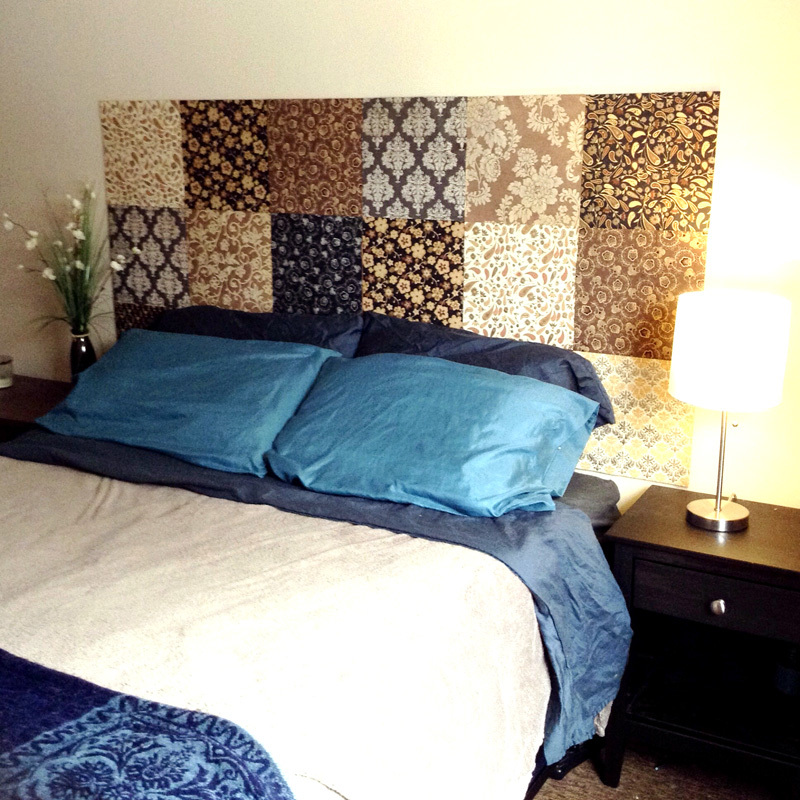 I've been flirting with the idea of making my own wall mounted headboard for quite some time now. 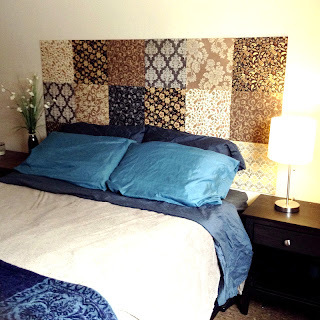 I had originally planned on making some type of patchwork upholstered headboard but my history of procrastination and indecisiveness is leading me to believe I won't likely be taking on that project anytime soon. Strolling around the dollar store the other day I came across some craft paper that intrigued me. The prints were great...Paisley, Floral, Damask... I immediately thought "Headboard!" I wasn't sure at first how I would accomplish the project... all I knew what I loved the prints on the paper and I needed to figure something out. I only bought about 6 packages at first just to take hope and lay out to see how all the prints would look together. I also wasn't sure what I would adhere them to before mounting on the wall. I got home, layed all the tiles on the floor... and it looked great (to my taste). I did the measurments and decided I wanted it to be 6 tiles by 3 tiles. I went back to the store the next day and bought a few more packages. I ended up buying more than I needed as some packages had 2 tiles each but some packeges I only liked one of the prints. For $1/pkg I wasn't concerned. This is way I arranged them on the floor. While I was at the store I came across these cork tiles. They're approximately 11.75" x 11.75". The craft paper squares are about 12" x 12" so I'd be able to adhere the craft paper to the tiles and cut the remaining off with my rotary blade. I used spray adheside to spray on the cork tiles and the back of the craft paper. 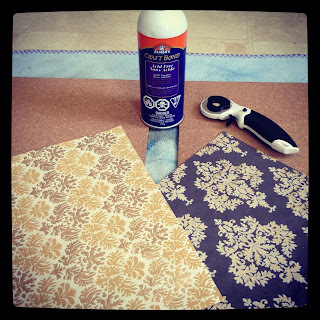 I tried to line at least one side of the craft paper up flush with the cork so I'd only have to cut 2 or 3 sides. 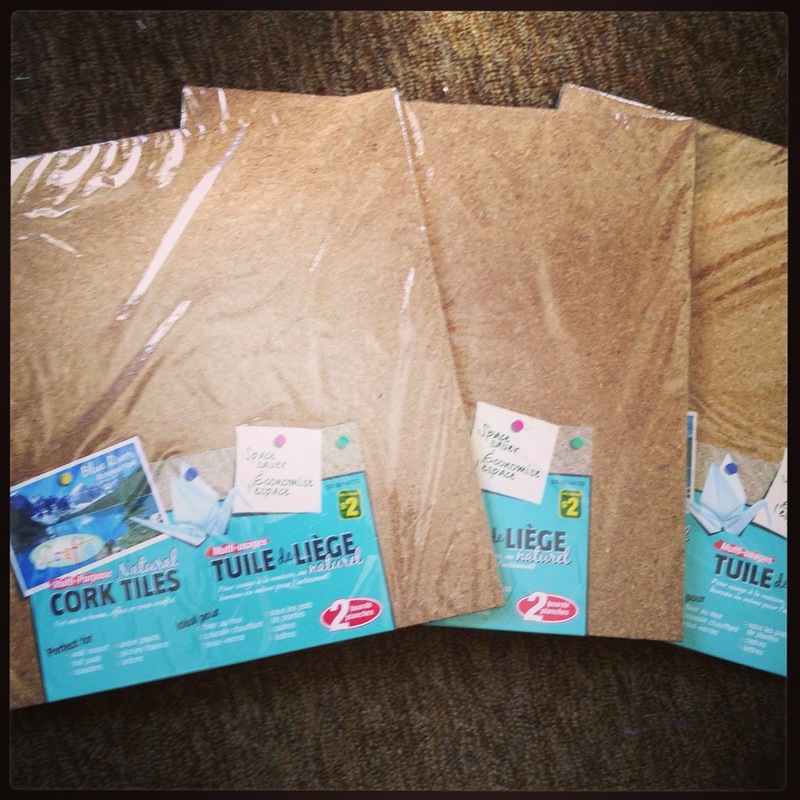 Right now I have a pile of paper-covered cork tiles sitting on my coffee table waiting to be hung above my bed. Still deciding whether I'll use Command strips or some type of double-sided tape to mount them on my wall. This is a really good idea. Seems easy to do and and affordable. Great job. I would love it if you would share this over at my link party.